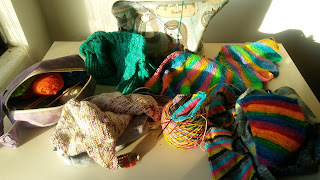 After Christmas knitting is finished, I often find myself wanting to cast on everything in sight because I'm so excited to knit whatever I want again. Not that my Christmas knitting isn't planned and set up by me but that is something else. This year, I finished my Christmas knitting on the 22nd and found myself with nothing much on the needles and lots of events yet to attend. 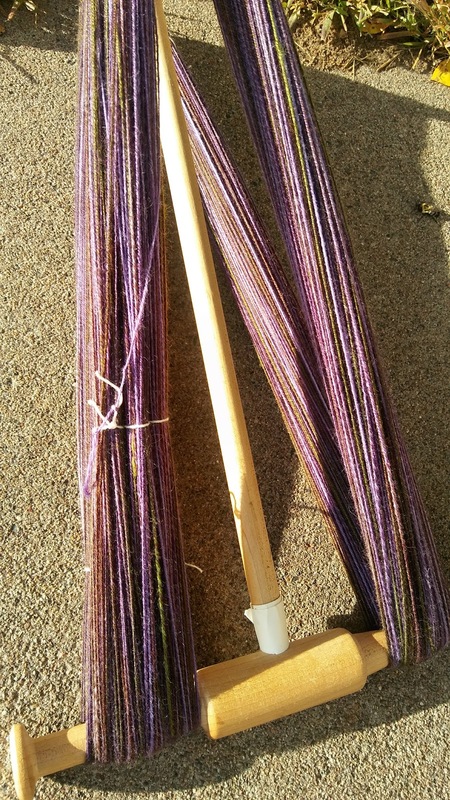 Since things were so busy, I ended up grabbing a skein of yarn that was already wound. I had previously cast on something with it but ripped it out so it was just sitting there waiting to be knit and I happened across it one day. Well, I ended up tucking it into my purse and after a few days, I had something. The start of a sock (of course). 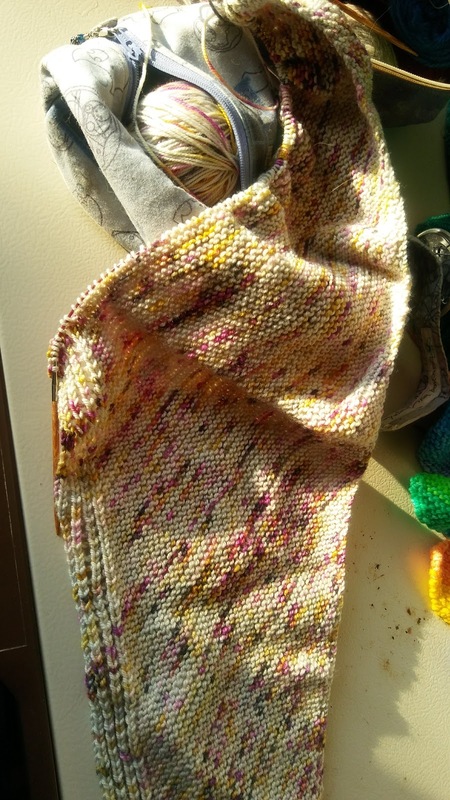 Knit with some curly yarn but it will block out. 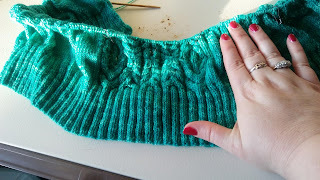 I've tried to knit on it here and there but I'm knitting the skew pattern again because I love how they fit so much and with this yarn they turn out so perfectly that I couldn't resist. That means that at intervals I have to pay pretty close attention to what I'm doing though so it isn't always something I can pick up and set down easily. 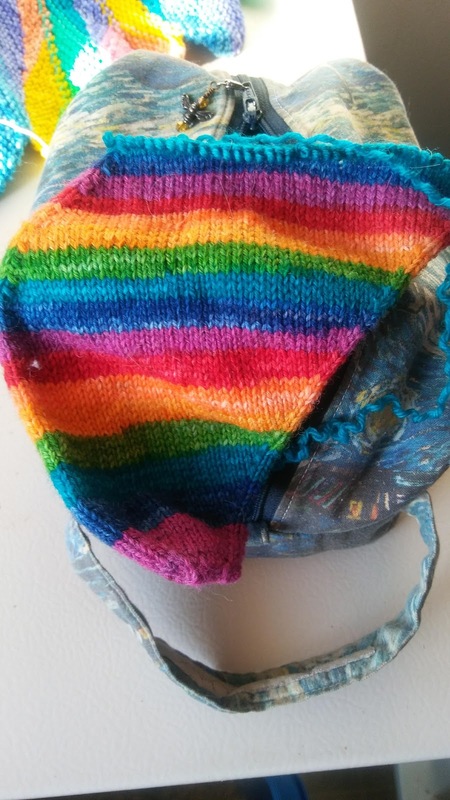 Honestly, it doesn't make a great purse sock for that reason so I should put a different sock in there but I haven't yet. 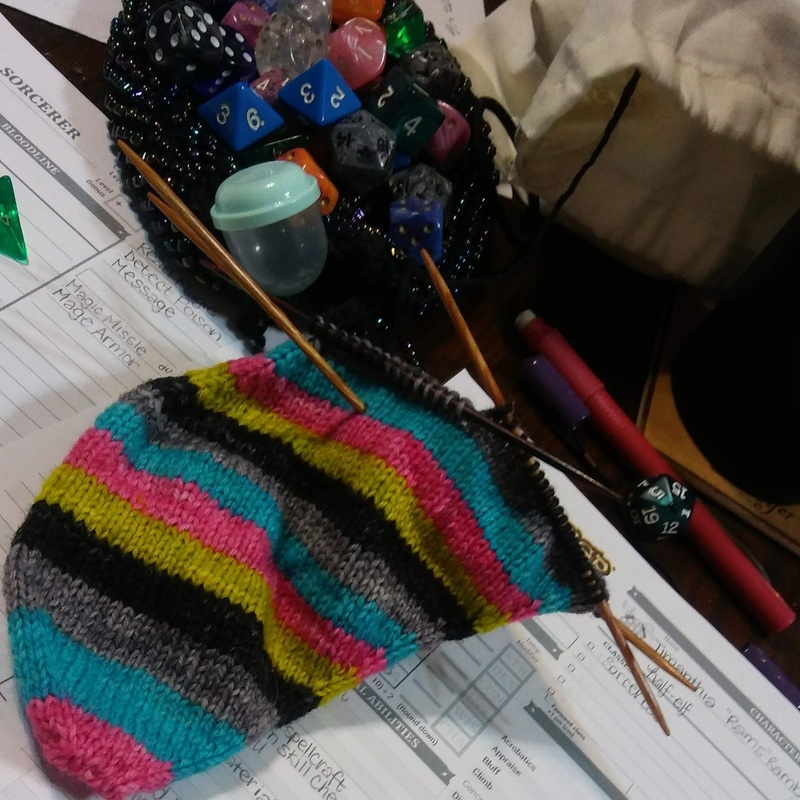 I even ended up taking the sock to a gaming session and knitting while waiting for my turn. 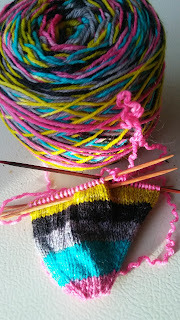 Anyway, all this to say that if I sit down with this sock for an hour or two, I could have a finished sock. Even despite all the paying attention issues and lack of time to knit, I have made progress. I sometimes feel like it isn't much progress and it doesn't seem to add up quickly but it does add up. I'm not trying to get all philosophical but honestly, that's kind of how I feel about life right now. I may be making progress (in some areas, let's be real, I can't be everything) but it feels like I'm not. It's there though, slowly adding up. 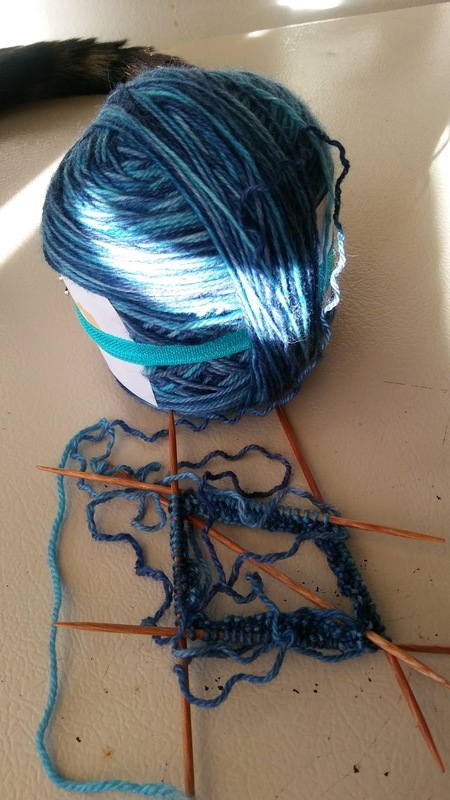 Just like knitting, stitch by stitch it gets done. The important part is to put in those stitches. How about you? Are you putting in any "stitches" on anything in your life lately? Knitting or otherwise. I'm neck deep in my Christmas knitting right now. Even though I said I wasn't going to do much this year that somehow morphed into 4 pairs of socks and a hat. 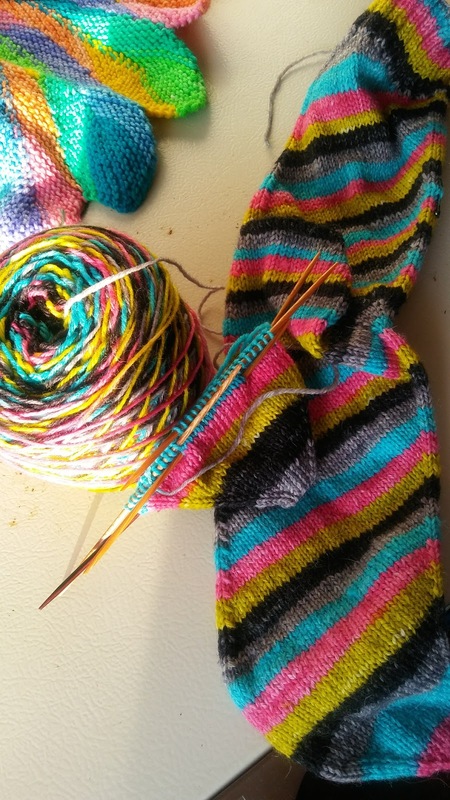 Thankfully I'm finished with 3 of the pairs of socks. 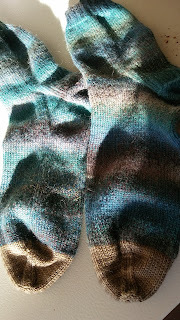 Including one slight mishap in which I ran out of yarn before I finished the toe and had to add on alternate toe yarn. I think they actually turned out all right with the alternate yarn toes though. I like them. I know these are not the best pictures. Lately I have been struggling with getting enough light for photos. It has made me think though, where do these gift knits end up? I, like most of us who gift knit, try to only knit for those who are knit-worthy. But I have also been known to whip up a quick ribbed hat as a gift for someone's new boyfriend or girlfriend who is showing up to Christmas, who I want to have a gift to open. 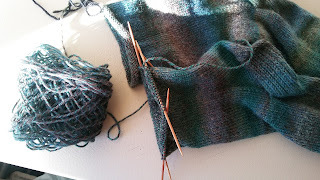 All this self-inflicted knitting has led me to ponder where these knits have ended up. 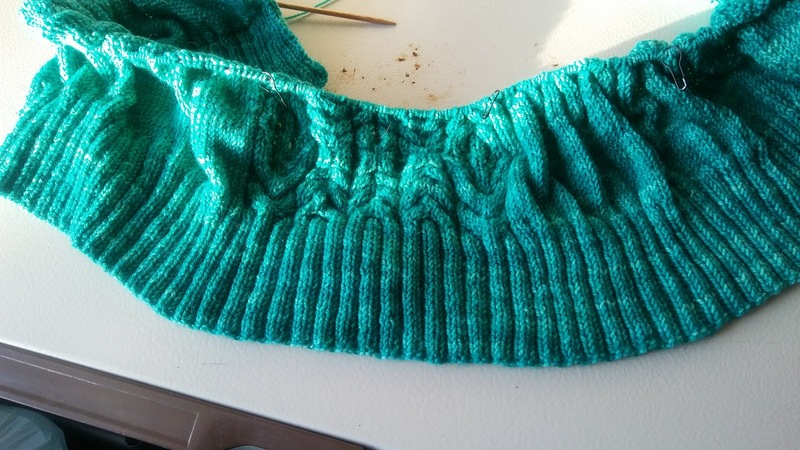 I love when I get feedback from people who use my knits until they wear out but some of these quick hats, I never see or hear of again. I wonder if they are pushed to the back of a closet. Or thrown out. Or maybe they are beloved. Someone's favorite hat. I don't know and I likely never will but it's interesting to think that they are out there in the world, those stitches knit with my hands. How about you? Do you know where all your gift knits have gone? 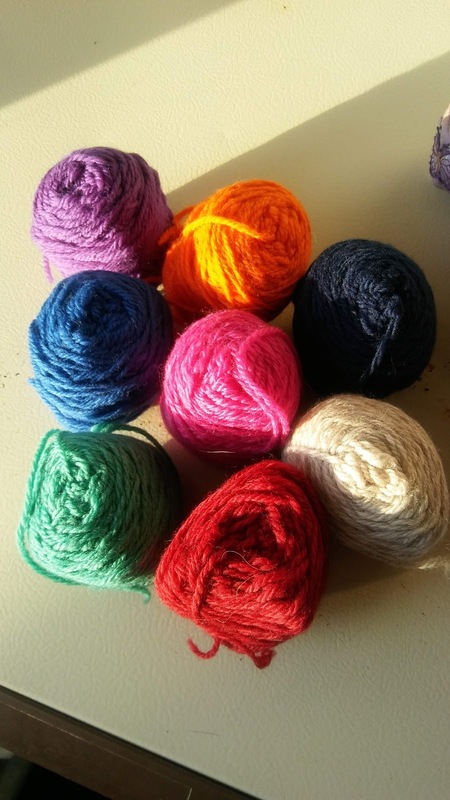 Do you ever get feedback from people about their knits? As we approach the holidays I'm finding my time filled to the brim with things that require attention. Shopping for loved ones, my car needed new tires so I had to take care of that, groceries need to be purchased so we have something to eat, etc. I'm finding that I have a limited number of attention points these days. Part of it is because I was taken down by a terrible cold complete with lots of sinus junk but also, I just don't have the attention to spare. I've been trying to be kind to myself, allow myself extra time to rest to get over this cold and therefore, I have nothing to show you. Nothing interesting to see here. 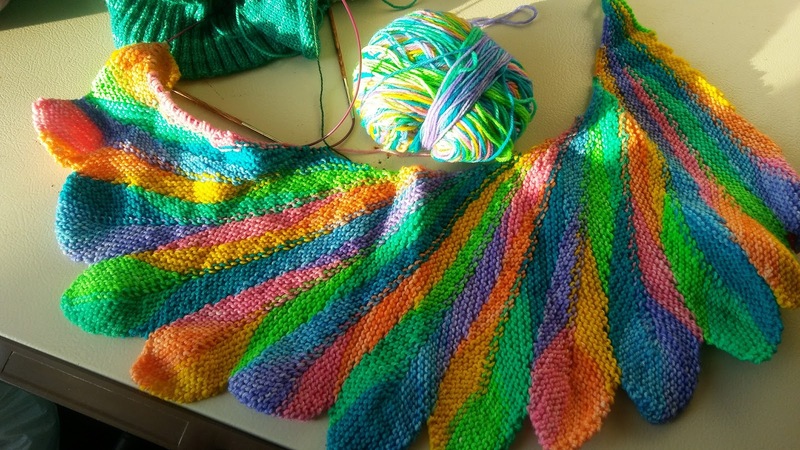 But I thought I should at least check in so you know that I'm still here, still trying to find time and attention for knitting. Hopefully more to show soon! I've really fallen back in love with reading this year. I set a goal to read 12 books last year on goodreads and I barely made it. So, the one goal I have stuck with this year is to read more. I set my reading goal at 18 books and I have blown it out of the water. I'm currently at 33 books and I have no intention of stopping now. I've really gone back to my book worm habits this year and I am loving it. I'm loving the escapism and I love listening to audio books when I'm doing other things, which is helping me to really move through the books. Just like with my spinning, even a few minutes here and there can add up. I just started Fawkes by Nadine Brandes because I joined a book club! I've always wanted to be in a book club and have never found one but this one seems perfect. It's online so I don't even have to get out of the house to attend. The creators chose this month's book but we will get to vote on next month's book. The November book is Fawkes and even though I'm a bit late, I joined last night and started the book. I like it so far and I can't wait to get farther into it and see where it goes. So far, I've only purchased ebooks this year (and tried to read books I already own) and I like that they're easier to store. Plus, I love the whispersync. If you don't know what that is, when you own the ebook and the audiobook you can read and listen at the same time. Then you can stop listening and just read if you wish (I tend to do this if I get to an exciting part because I read faster and get annoyed that the audiobook is too slow) or just listen. Like I said, I enjoy both and I love being able to go back and forth. I know this isn't really related to any of my crafting except that I've been reading WHILE I craft a whole bunch this year, but I'm thinking about talking a little about the books I read here. I tend to focus on fiction/fantasy and lately have been into more Young Adult fiction than anything. So if some short book reviews or book recommendations are something you're interested in, let me know. I would also love to know what you are reading, leave me a comment with your book recommendations. I love adding to my Amazon Wish list and I told my husband all I want for Christmas is items off my Amazon Book wish list this year. Time seems to keep slipping by me. My focus lately has been on getting my house in some sort of order since we are hosting my in-laws for Thanksgiving and to be honest if anyone came to the door right now I would hide. Housework just isn't a priority for me, I prefer crafting. But since I know we will be having people over, I'm trying to get some sort of order from our mess. That means crafting has taken a back seat and I'm finding very little time or inclination to do anything once I'm done for the evening. I'm just too tired. A full bobbin! Yeah! This is some Merino from Gritty Knits that I lost the tag for so I have no clue how long it's been lying around. It seemed very autumny when I started it though and I love the singles, although I'm not a big brown person. I think the red tones are making up for it. 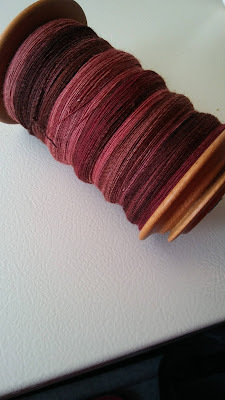 I spun it all onto one bobbin so I will eventually chain-ply it but for now it will rest and I will just spin something else since plying requires too much effort when I'm tired from a long day of work then deep cleaning and cooking supper. 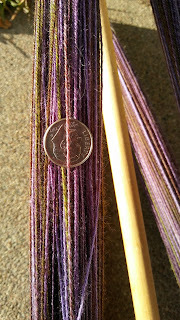 You may have noticed that spinning has been pretty lacking around chez Kalkette. It's true, when all the family stuff happened right at the start of Tour de Fleece, my spinning got put on a very back burner. I tried several times to get back to it but it seemed to be a struggle every time and so I let it go. 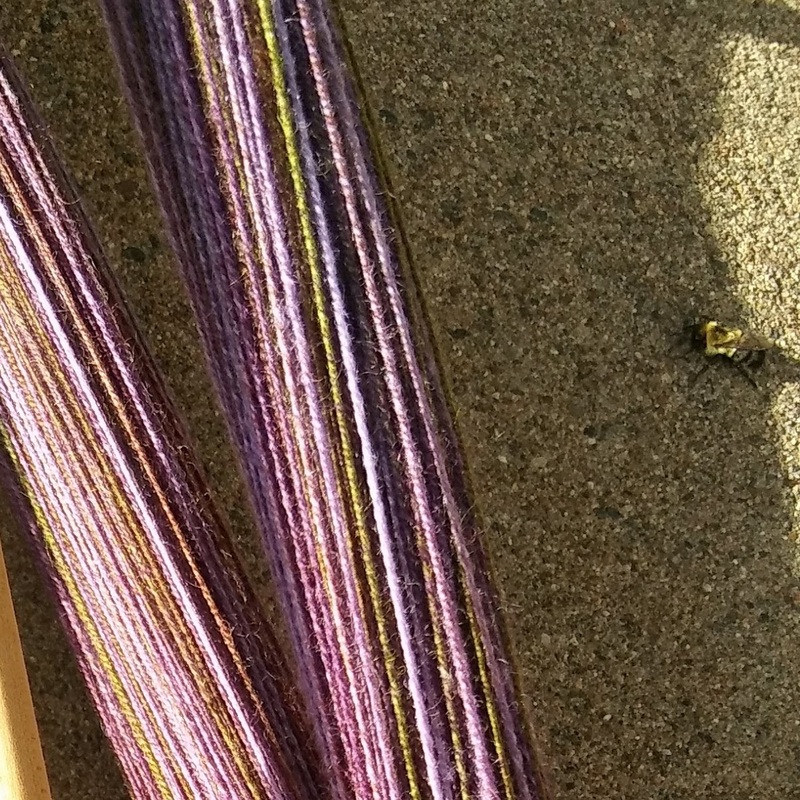 That means I didn't even finish one skein of yarn from the tour this year which is a little hard for me to believe. I did try to keep plugging away when I could and I finally, finally finished the fiber I started at the beginning of the tour. 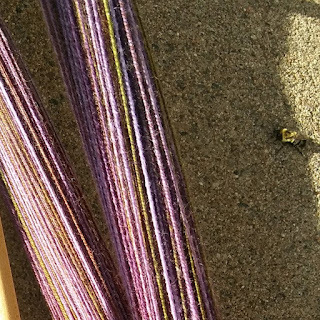 It's a braid of Superwash BFL from Freckle Faced Fibers in Guinevere and the colors are washed out here, it's a much deeper, rich purple and green with hints of brown. 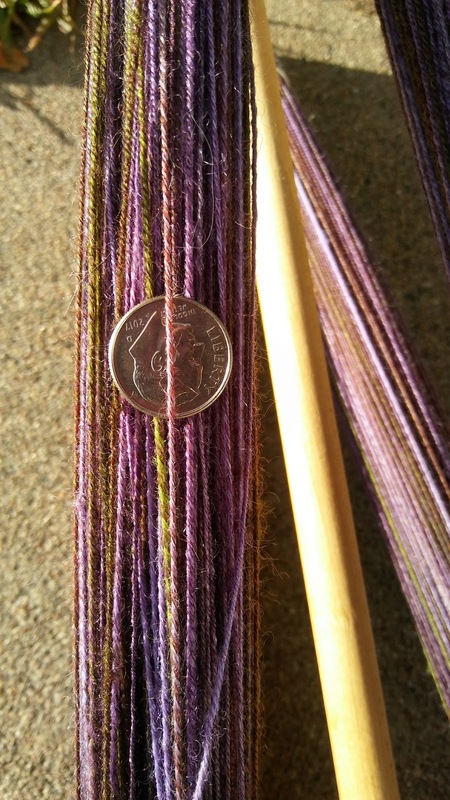 I've realized I'm not a big fan of spinning BFL (Blue Faced Leister) so I have either destashed, or spun what I had but I found this braid of Superwash BFL in my stash and decided to keep it and spin it. 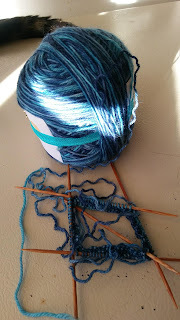 The reason I'm not a big fan of it is because I seem to get a really dense yarn and therefore much less yardage than I anticipate which can be frustrating if I have a project in mind. With this being superwash, I thought it was worth it to try once more. 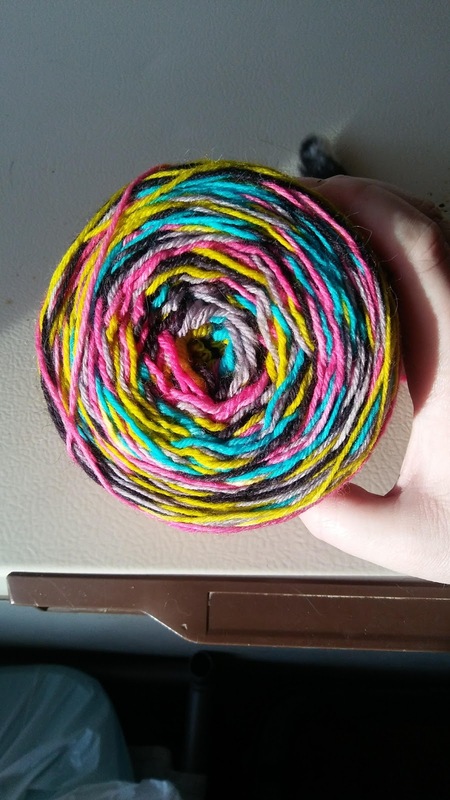 I also did everything I could to ensure I got the yarn I wanted. I split the braid and carefully predrafted each piece, taking my time so I could get the results I wanted. 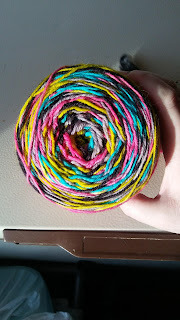 I went into this hoping to knit some handspun socks from this braid and once it was spun and chain-plied, I think I can safely say it's ready to become some lovely socks. So lovely. The skein has been removed from the Niddy Noddy and washed now so it's ready to go. But check out this little surprise from when I did this photo shoot. Surprise Bumblebee! It was hanging out drying its wings and I didn't even notice it until I was picking up the Niddy Noddy to head back into the house. Hopefully this finished skein will help motivate me to get back to the wheel sometimes and enjoy my spinning more.